The Oasis is ready to become your own personal oasis! This creative swimming pool provides ample space to maximize the summer fun! From a 7′ 11″ deep end, to free form layout, bench seating & curved entry steps; it does it all. Find out more about this amazing fiberglass pool below. 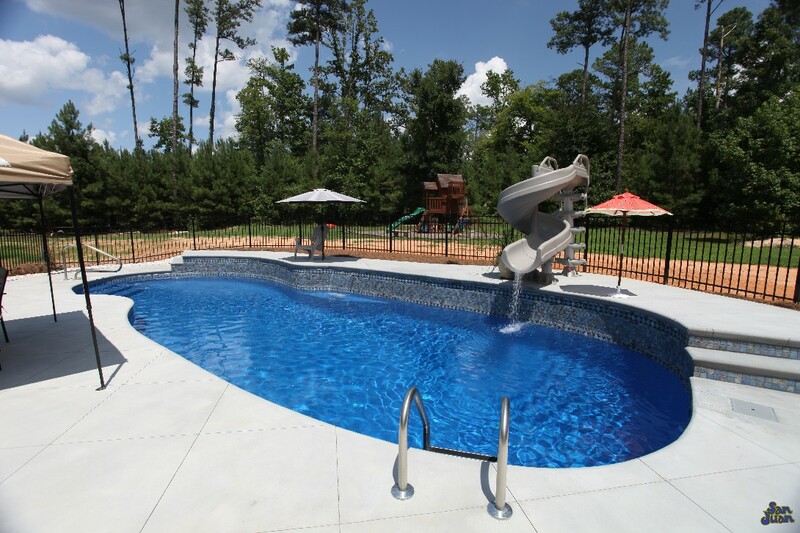 The Oasis is a free form fiberglass swimming pool designed to provide room for loads of summer fun. This gorgeous free form layout includes curving edges and a large deep end of 7′ 11″. That’s a lot of space for the kiddos and family to swim. You’re sure to love the space and the opportunities it provides for fantastic pool games and outdoor activities. We classify the Oasis as a free form swimming pool due to it’s “outside the lines” personality. It’s curving walls create a few unique sitting positions, including a bench seat and curved entry steps. Whatever you’re looking for, the Oasis has it to offer. We recommend sprucing up it’s design with a winding water slide (shown above) or even a raised wall (also shown above). You can utilize the Oasis in a very creative way because of it’s large size. Want more options? 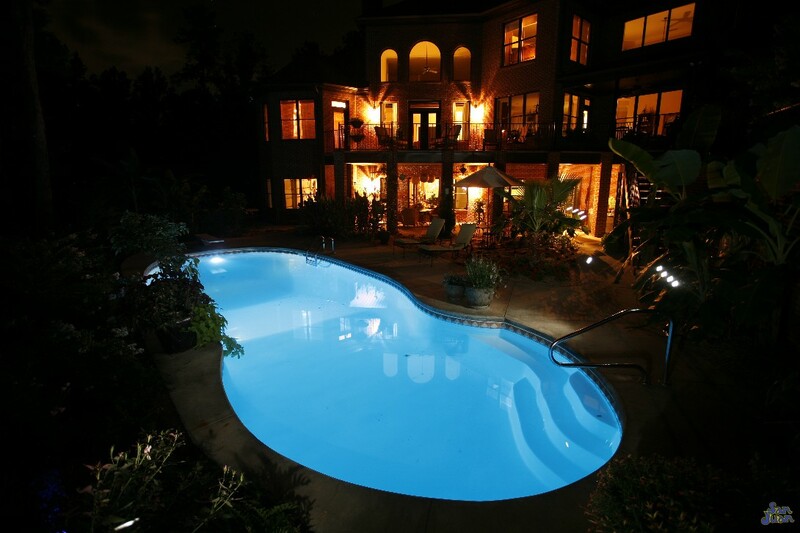 Feel free to compare the Oasis to our other Large Fiberglass Swimming Pools. We give you options because we believe you should have the power to choose! Upon entering the Oasis, you’ll notice the beautiful curved entry steps located inside the twisting shallow end. This style of bench seating is unique to this design and accentuates the modern flare of the Oasis fiberglass pool! If you’ve been following us for sometime or are familiar with our pool models, the Oasis looks very similar to the Venetian or the Atlantic pool models. Our clients love the swooping edges of these pool models. It sort of resembles a Figure-8 crossed with a Free Form layout. Lastly, if you’re into entertaining the kiddos over the summer, the Oasis may be the perfect swimming pool! The huge surface area of 496 SQFT provides you with a large deck space to ornament however you wish. Purchase some patio furniture to adorn the side and entertain your swimmers with a fun, winding water slide. You could even supply a diving board that complies with the ANSI Regulations. In conclusion, the Oasis is a fantastic option to elevate the fun of your outdoor living space. 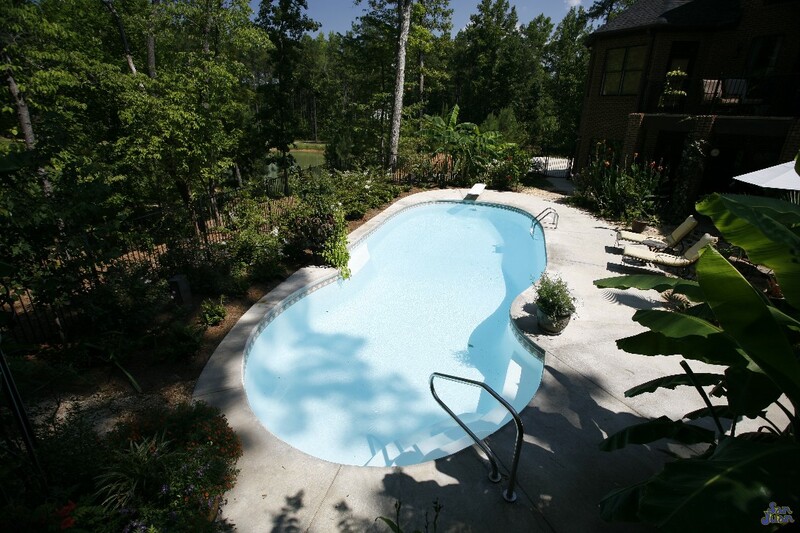 This large fiberglass swimming pool provides ample space for recreational activities. 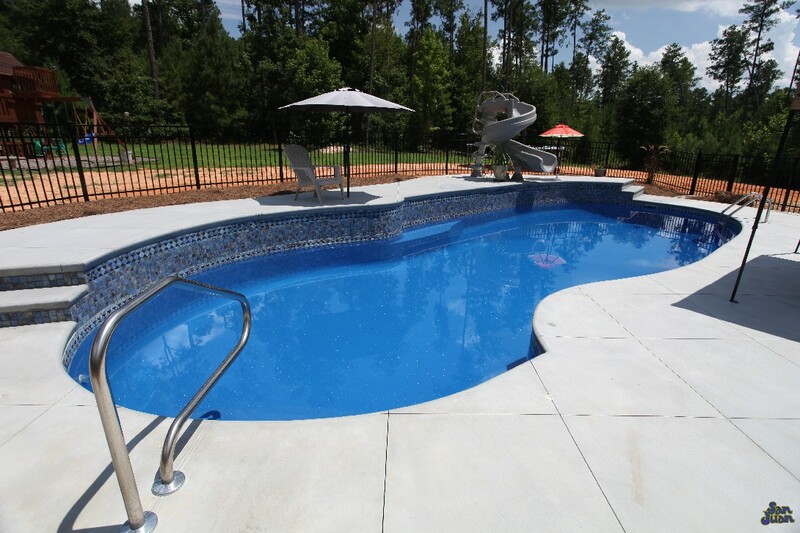 You’ll love the large deep end of 7′ 11″ plus the huge size of 17,950 Gallons. This fiberglass pool is designed for hours of fun and play. Dress it up with water slides, a basketball hoop, volleyball net or outdoor furniture. The more you add to it, the more amount of fun that it can provide. 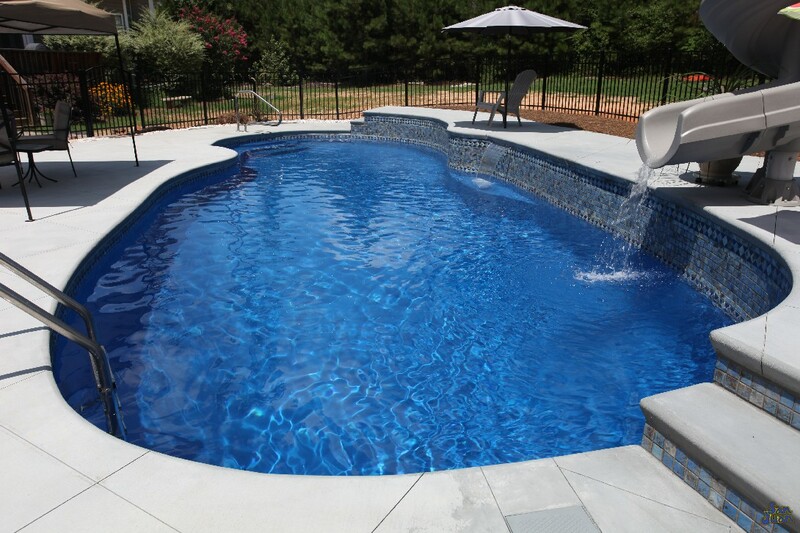 Therefore, if you’re on the market for the perfect addition to your home, we highly recommend the Oasis fiberglass pool!